Three months ago I left the quiet Massachusetts neighborhood I grew up in to move Washington, D.C. One of my first impressions of the city as I walked around was how drastically the neighborhoods changed from block to block. In my own neighborhood in Northeast D.C., I was surprised to find that after walking only a few blocks I ran into a Starbucks, a Chipotle, and a Barnes and Noble. The residential area my house was in felt worlds away from the perfectly paved sidewalks and the gleaming new buildings I encountered on my walk. I thought to myself, this just doesn’t seem to fit. I was also shocked to hear that D.C. has one of the largest homeless populations in the United States. When I first arrived in D.C., the city seemed so robust that I never considered homelessness might be a major issue. And yet, as I ventured into more of D.C.’s neighborhoods, I began to see more and more people experiencing homelessness. I wondered, how can a city so rooted in public service have people living on the streets? Some may look at the gentrification sweeping through D.C. and many other cities as a way of moving the city forward. What they may not realize, however, is that it also leaves people behind. Once every few months, the NETWORK staff participates in a Political Ministry Day: a chance to engage in service, immersion, and reflection together. Recently, we spent part of our day at The Washington Legal Clinic for the Homeless, which provides legal assistance and “Know Your Rights” resources to anyone suffering from homelessness. During the afternoon, we heard from Patty Fugere, the Clinic’s Executive Director, who facilitated a panel with LaJuan and LaTreviette, two women who have experienced homelessness. After they shared their lived experiences, Patty talked about how difficult it is to find affordable housing in D.C. She said new housing units are constantly being built, but they are almost always out of range for low-income folks. As I listened to a mix of personal stories and harsh realities, I was astounded by the pervasiveness of the affordable housing crisis and its effects. While it seems like there is an overwhelming amount of construction in D.C., the new apartments and homes are drastically out of the price range for low-income families. 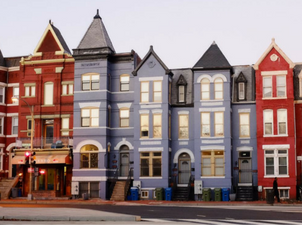 According to a study by Freddie Mac, between 2010 and 2016 the amount of affordable housing for low-income families in Washington D.C. dropped by 60%. Without access to affordable housing, individuals become cost-burdened (spend more than 30% of income on housing), they are unable to build wealth, and they become increasingly susceptible to poverty. Another issue lies in who affordable housing is available for. “Affordable rental units” are units available for families making 50% of the average median income. In Washington D.C., 50% of the average median income for a family of four ranges from $55,000 to $88,000. What does that mean for the drastic number of families making below $55,000? Where are they supposed to find housing? With their income level, how are they supposed to choose between housing, food, and everything else they need to provide for their family? The lack of affordable housing in Washington, D.C. and across the country needs to be amongst the first issues addressed in order to adequately respond to the members of our community who are experiencing homelessness or are who are extremely cost-burdened. If we continue avoiding this issue, we are shirking our responsibilities to our sisters and brothers. This entry was posted in Emerging Justice Seekers, Front Page, Housing, Income, Mend the Gap, Women and Families on December 20, 2017 by maryc.